Getting the full benefit of a conference involves some focus and forward planning. Identify what you want to get out of the conference. Think about what attracted you to the conference, what you hope to learn, who you hope to connect with, what questions you’d like answered and what changes you hope to make as a result. This will help you choose what sessions to attend and provide a framework for you to evaluate how useful the event was in meeting your needs. Whether it’s reading speaker bios or familiarising yourself with the program it will help identify how you’ll spend your time and help you feel more organised when you get there. Don’t spread yourself too thin. If there’s a full conference program it’s tempting to try to go to everything. If you find it hard to choose which sessions to go to co-ordinate with colleagues so that you can share different concurrent sessions and catch up afterward for debriefing and sharing of materials. 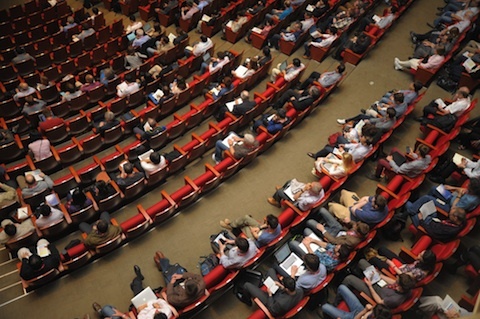 Share your experiences, ask questions, and offer an opinion during conference sessions. This gives others the benefit of your insights. Peer-to-peer sharing and interaction is how so much of the learning at conferences happens. Summarise highlights or nuggets of information through your professional networks online. It’s a great way for people who aren’t at the conference to get the benefit of your insights. Go to at least one session that is new territory for you. You might be surprised to discover a new interest, a hidden talent or a new perspective on a familiar problem. Mingle and make new connections. It’s a great way to meet people with the same interests as you and who work in the same field. You may well meet a potential mentor or research partner in a relaxed and convivial environment. Allow time for reflecting on the presentations you’ve seen, take walking breaks and get some fresh air in between sessions so you don’t burn yourself out. Bring the highlights of the conference back to your workplace and/or to your professional networks. Think of ways you can actively apply what you’ve learned to make changes and improvements. Review the goals you set yourself at the beginning and write down what you accomplished from taking part. This is a great way to keep track of your professional development and what you’ve learned and achieved over time.